Trance titans Aly & Fila make their New York City return this weekend—and The Nocturnal Times wants to make sure you’ve got a chance to kick-up the BPMs with the iconic trance duo! This Saturday, November 7, join Aly & Fila at Pacha nightclub for a trance-filled-evening. 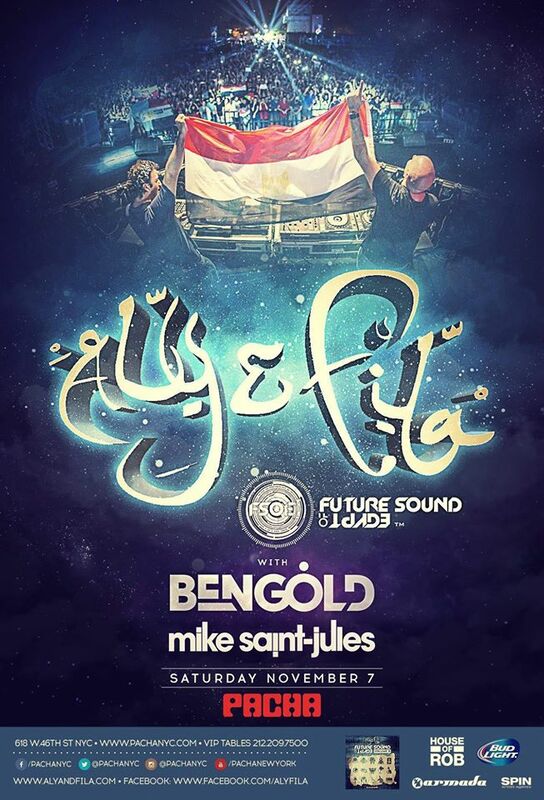 Ben Gold and Mike Saint-Jules will join the Future Sound of Egypt duo on Saturday as supporting acts. Famous for their Future Sound of Egypt radio show and record label, Aly & Fila regularly provide the latest in uplifting trance to their dedicated fan base. In 2015, the pair has released singles “The Other Side” with Aruna, “Running” with SkyPatrol ft. Sue McLaren, “Shine” with Roxanne Emery, “A New Age (FSOE 400 Anthem)” with Omar Sherif & Jonathan Carvajal, and “Napoleon” with Ferry Tayle. Next on their FSOE agenda: Bring FSOE 450 to various locations across the world in 2016! *Contest ends on Fri., Nov. 6 at 10 pm EST. Tickets for Aly & Fila at Pacha NYC are available HERE.